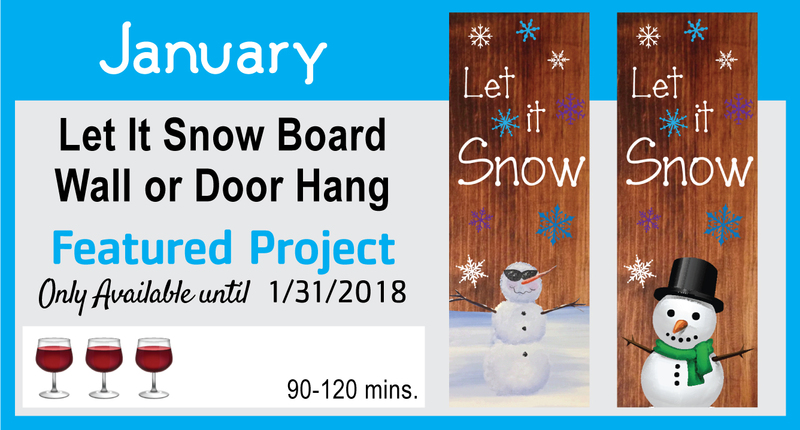 You don’t want to miss any of these awesome limited time projects! Each month we will feature a different DIY project that is ONLY available during that month. January 2018 we are featuring this wood sign with a snowman painted on, and “Let It Snow” stenciled words. We’ll have various snowman options available. As with all DIY projects, this project is limited to stock on hand. We will do our best to have excess stock available for our Featured Projects. Hurry, offer expires 11:59pm on Super Sunday! Please allow a few days for a response to your party request. Thank you! Hurry, offer expires 11:59pm on Small Business Saturday! Hurry, offer expires 11:59pm on Black Friday! This sale is now over, thank you for your continued support! What we have to offer . . .